Once a small mining center and railroad town in California's Mojave Desert, Barstow is located at the junction of 3 major highways -- Interstate 15, Interstate 40 and State Highway 58. It is centrally located in the western Mojave at the entrance to the Mojave National Preserve and is home of the U.S. Army National Training Center, Marine Corps Logistics Base, NASA's Goldstone Deep Space Network and Burlington Northern-Santa Fe Railroad Yards. Located in the high Mojave Desert of Eastern California, Barstow is extremely dry year round, with less than 5 inches of rain annually. Summertime temperatures can be extreme, exceeding 100 °F, while winter temperatures can be cold, and may drop below freezing. Dress appropriately and carry plenty of water. Located on the Mojave River, the Barstow area became a mining center late in the 1800s. Daggett, 5 miles downriver, was founded in the 1860s. It was originally called Calico Junction but was renamed after California Lieutenant Governor John Daggett when silver was discovered 6 miles north in the Calico Mountains in 1882. The finding of silver in Calico and the building of the Southern Pacific Railroad from Mohave to Daggett in 1882 made the area a mining center. The famous 20-mule teams came into being when 10 teams were hitched together with two wagons and a water wagon to haul ore from Daggett to the town of Calico. The Calico Railroad (later called the Daggett-Calico Railroad) started hauling ore from Calico to the Oro Grande Milling Company, across the river from Daggett in 1888. The railroad closed down in 1892 and the mine shut down in 1896 when all the silver had played out. But in 1883, the borax rush hit Calico, and by 1902, Daggett was supported by 3 borax mines employing 200 men. It is estimated that borax taken from the Calico Hills amounted to more than $9 million, while more than $90 million in silver was removed. As the 20th century progressed, Calico and Daggett diminished while Barstow grew. It became a busy rail center and a jumping off place for immigrants entering the state on US Route 66, as made famous by John Steinbeck's novel "The Grapes of Wrath." Modern and historic facilities are still available along Barstow's Main Street, the original Route 66. Just off Main Street, at First Street, travelers can drive over an old iron bridge that leads to the railroad depot once the site of the historic Harvey House, originally opened in 1911. With the construction of the modern Interstate Highway system Barstow's future of growth was assured, as I-40 and I-15 converged at the city limits with State Highway 58, making it the transportation hub of the western Mojave Desert. 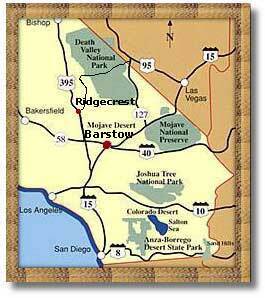 Barstow is a great starting point when touring the western Mojave Desert. Outdoor explorers, amateur geologists and hikers enjoy nearby Rainbow Basin and Owl Canyon Campground, Afton Canyon, Kelso Dunes, and many other adventures, including Calico Early Man Site, historic Harvey House Depot, Calico Ghost Town, a restored silver mining town and the world-class water park complex at Lake Dolores. Baker, California: 62 miles northeast. Victorville, California: 34 miles southwest. Mojave, California: 70 miles west. Ridgecrest, California: 80 miles northwest. San Bernardino, California: 73 miles west. Death Valley National Park: 90 miles northeast. Mitchell Caverns State Park: 115 miles northeast. Rainbow Basin National Natural Landmark: 15 miles north. Mojave Preserve: 60 miles east. Amboy Crater: 90 miles west. Afton Canyon Preserve: 36 miles northeast. Johnson Valley Off-Highway Vehicle Area: 35 miles northwest. Rasor Off-Highway Vehicle Area: 45 miles north. Black Canyon & Inscription Canyons: 31 miles northwest. Cima Dome: 110 miles east. Calico Early Man Site: 10 miles east. Calico Ghost Town Regional Park: 15 miles east. Daggett Prospector: 5 miles east. Mojave Road Historical Trail: northeast of Daggett.